The Chicago Marathon is just a few weeks away, and I'm already thinking about what to pack for race day. Yesterday, George and Henry joined me at the track for my speed workout, and to keep my mind off of how tired my legs felt, I tried making a mental list of the items I want to be sure to bring with me to Chicago. Running is so much more fun with these two! One of the best tips I was given before running my first marathon was to bring a bag of pre and post-run essentials to the race. Most races greater than 10k in distance will offer a bag check near the starting line. You can ask whether one is offered when you go to pick up your race packet. If a bag check is offered, I highly recommend that you pack a few necessities. If they don't offer a bag check, and you're running a half-marathon or full-marathon, kindly ask a family member or friend, who plans on watching you run, to bring your bag to the finish line for you. If you've been here before, you know that I'm a big fan of Nuun electrolyte tabs. Besides being easier on my stomach than Gatorade, they're also portable and the containers are the perfect sized waterproof storage for little things that can easily get lost in the bottom of your bag (see #2, #4, & #7). Since electrolyte replacement is important after you run, I like to pop a tab into the water bottle that is usually offered at the finish line. As for the nutrition bar, it's important to begin consuming protein and carbs after the run not only to restore your energy but also for muscle recovery. I've been to plenty of races where either the finish line food (pizza!) is too rich for me to eat after a long race, or the food had run out before I could get to it, so I always keep something with me just in case the finish line fare is a flop. If you need some suggestions on what kind to try, here's a list of goodies for you. Most well-run races offer first-aid stations along the route and at the finish line for anyone who is in need of medical attention. I hate to get in line ahead of someone who really needs help just for a blister, so bringing a few 1st aid items with me is just seems easier. A few blister band-aids, some ibuprofen, and Deep Blue essential oil or Biofreeze will usually cover any mild post-race ailments. I keep everything in a Nuun tube! Chaffing is a serious thing. I'm telling you, it hurts! I keep a tube of Glide with me at all times. Key areas to cover are bra lines, inner arms and inner legs, and any place else your clothing might rub. P.S. Ladies, you don't need the Body Glide for women. Just use the original - it's the exact same stuff - and it's cheaper. When you receive your bib at packet pick-up, safety pins are either included in your packet or offered at the pick-up table in a box. There have been times when the pins were not included in my packet, and I failed to grab some at the table. So, having a few extra in your bag ensures you'll never be scrambling at the last minute to find a way to keep your bib in place. The only thing that sounds better than food after logging twenty six miles is a nice long shower. But sometimes it can take a while to get back home or to your hotel after the race. Having some type of wet wipe on hand to freshen up with after the race can feel really good. There's probably some sort of super-fancy wipe out there that guaranteed to make you feel like you just left the spa, but baby wipes tackle the salty sweat without leaving a sticky residue, and they're cheap. Win win! Because most long distance races take place on pavement, your feet really take a pounding. And, if you happen to have suffered a blister or loss of a toe nail(s) along the route, a pair of flip-flops can feel heavenly after the race. I've recently become a big fan of this brand. They offer both comfort and support to tired aching feet. The minute you stop running, your body moves into cool-down mode. It's not uncommon to feel chilly yet be dripping with sweat at the same time. Changing into a dry t-shirt can help keep the chills at bay as your body works to regulate back to a normal temperature. Girls, you know that nothing is worse than having your hair tie snap right before a race. Keep a couple of extras on hand just in case (again, Nuun tube!). And, it's also a good idea to throw a dri-fit hat into your bag in case it's raining at the starting line, or you have a sunglasses mishap. If you're a seasoned runner, you probably watch the weather report days before the race even takes place. And, if showers are in the forecast, you know that nothing feels worse than standing around in the rain waiting for the race to start. Keep an inexpensive poncho in your bag, one that can be taken of right before the race and thrown away. You'll be so glad you did! 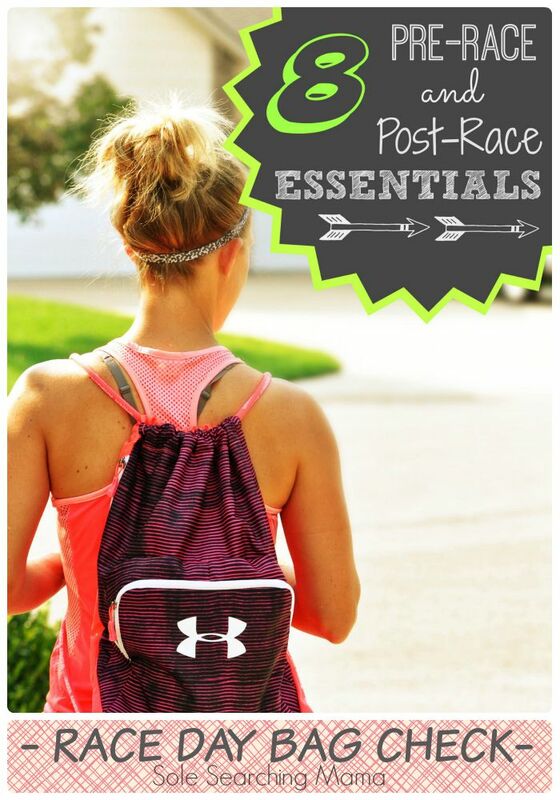 What do you keep in your race day bag?